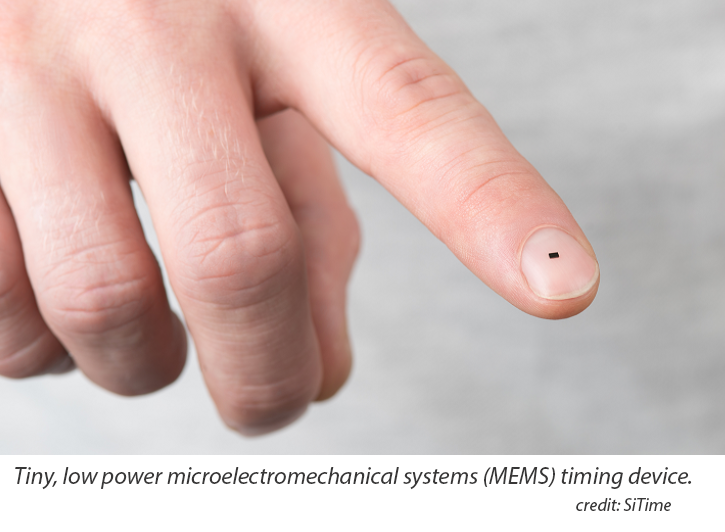 SiTime, which supplies MEMS timing solutions, and Bosch, a global supplier of technology and services, announced a strategic technology partnership to accelerate innovation in micro-electro-mechanical systems (MEMS) timing. Specifically, SiTime will work with Bosch to develop processes for next-generation MEMS resonator products. These MEMS resonators are the heartbeat of 5G, IoT and automotive electronics, and will enable the higher speeds of 5G, long battery life of IoT devices and increased reliability of driver assistance systems in automotive. Bosch will utilize its expertise in MEMS manufacturing to produce these resonators for SiTime and ensure availability of high-volume capacity. SiTime has shipped over a billion units of its MEMS timeing solutions into all electronics markets, has over 90 percent share of the MEMS timing market, and has partnered with industry leaders, such as Intel, to drive timing innovation in 5G. Ericsson agreed to acquire CENX, a privately-held company that offers a hyper-scale service assurance platform across virtual and hybrid networks. Financial terms were not disclosed. CENX, founded in 2009, is headquartered in Jersey City, New Jersey. The company achieved significant year-over-year revenue growth in the fiscal year that ended December 31, 2017. CENX employs 185 people. Ericsson has held a minority stake in CENX since 2012. Ericsson said the acquisition will boost its Operations Support Systems (OSS) portfolio with vendor-agnostic service assurance and closed-loop automation capability, including in NFV and orchestration. CENX was co-founded in 2009 as a Carrier Ethernet Neutral Exchange by Mr. Nan Chen, who is also the founder and president of MEF. Previous investors in CENX have included BDC Capital, Mistral Venture Partners, VMware, Highland Capital Partners, Mesirow Financial Private Equity Inc., Verizon Ventures, a subsidiary of Verizon Communications, Ericsson, DCM Ventures, and Cross Creek Advisors. CENX announced a contract to provide its hyper-scale service assurance platform to a globally recognized European Tier 1 operator. CENX's hyper-scale service assurance platform enables closed-loop assurance automation across virtual and hybrid networks. Baidu and Intel outlined new artificial intelligence (AI) collaborations showcasing applications ranging from financial services and shipping to video content detection. Specifically, Baidu Cloud is leveraging Intel Xeon Scalable processors and the Intel Math Kernel Library-Deep Neural Network (Intel® MKL-DNN) as part of a new financial services solution for leading China banks; the Intel OpenVINO toolkit in new AI edge distribution and video solutions; and Intel Optane™ technology and Intel QLC NAND SSD technology for enhanced object storage. “Intel is collaborating with Baidu Cloud to deliver end-to-end AI solutions. Adopting a new chip or optimizing a single framework is not enough to meet the demands of new AI workloads. What’s required is sysatems-level integration with software optimization, and Intel is enabling this through our expertise and extensive portfolio of AI technologies – all in the name of helping our customers achieve their AI goals,” stated Raejeanne Skillern, Intel vice president, Data Center Group, and general manager, Cloud Service Provider. Platform Group. Semtech announced sampling of its quad Tri-Edge clock and data recovery (CDR) with an integrated vertical-cavity surface-emitting laser (VCSEL) driver and its quad Tri-Edge CDR with an integrated transimpedance amplifier (TIA). The bundle is optimized for low power and low cost PAM4 short-reach, 200G/400G QSFP28 SR4/8 modules for data center and active optical cable (AOC) applications. “With this Tri-Edge PAM4 CDR bundle, Semtech further demonstrates its innovative and disruptive solutions to alternatives available in the market today. We expect this to enable the next-gen deployment for data centers to allow higher bandwidth growth while supporting an aggressive cost structure,” said Dr. Timothy Vang, Vice President of Marketing and Applications for Semtech’s Signal Integrity Products Group. the full production of its ClearEdge CDR platform IC bundle targeting high-performance data center and wireless applications. The quad ClearEdge CDR with integrated DML laser driver and quad ClearEdge CDR with integrated transimpedance amplifier (TIA) provides an optimized chipset for 100G PSM4 and CWDM4 module solutions. The quad ClearEdge CDR with integrated DML laser driver also supports module designs based on both chip-on-board optics and passive TOSAs. initial production of its bi-directional ClearEdge CDR with integrated DML laser driver. mass production of a fully integrated quad 28G ClearEdge CDR with single-ended electro-absorption modulated lasers (EML) laser driver, consuming only 790 mW at maximum, 1.5 Vppse swing, in a 6mm x 5mm package with integrated bias-T passive components. This addresses the challenge of shrinking real estate in QSFP28 designs. Lattice Semiconductor announced the appointment of Steve Douglass as Corporate Vice President, R&D. Douglass previously served as the Corporate Vice President, Customer Technology Deployment at Xilinx.